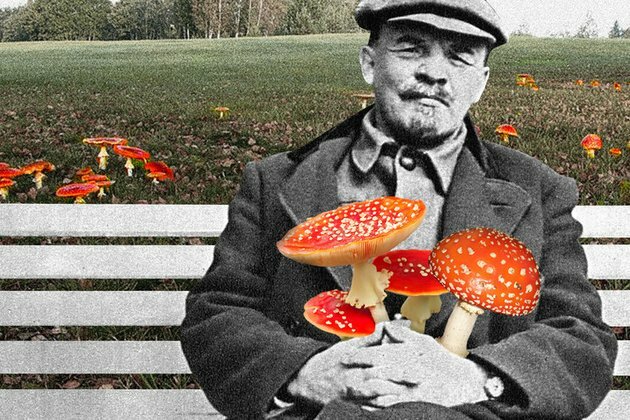 Once people heard on the TV that Vladimir Lenin's relations with mushrooms were a bit more complicated than everyone thought, the Soviet audience was shocked. Alexander Kislov In the early 1990s, a bizarre TV hoax divided late-Soviet society. In 1991, just months before the collapse of the USSR, Soviet audiences witnessed a shocking scene on television program Pyatoe Koleso (The Fifth Wheel). Two serious-looking men - Sergey Sholokhov, the host and his guest, an underground musician and writer introduced as "politician and actor" Sergey Kurekhin were sitting in a studio discussing the October revolution of 1917. Suddenly, Kurekhin offered a very interesting hypothesis - that Vladimir Lenin, the Bolshevik leader, was not a human being but a mushroom. Sergey Kurekhin (1954 - 1996): a musician, an artist and the man who created the Lenin Was A Mushroom hoax. Yury Pilipenko/Global Look Press Kurekhin started with a rambling discourse on the nature of revolutions and his trip to Mexico where, in ancient temples, he had seen frescos closely resembling the events of 1917. From there, he moved on to the author Carlos Castaneda who described the practices of Central American Indians of using psychotropic drinks prepared from certain types of cacti. "Apart from cacti, Castaneda describes mushrooms as special products with a hallucinogenic effect," Kurekhin continued and then quoted Lenin's letter to leading Marxist Georgi Plekhanov: "Yesterday I ate many mushrooms and felt marvelously well". Noting that Russia's fly-agaric mushroom has hallucinogenic effects, Kurekhin assumed that Lenin was consuming these kinds of mushrooms and had some kind of psychedelic, mind-altering experience. It was not only Lenin who dabbled in such fungi, but other Bolsheviks as well, Kurekhin claimed. "The October revolution was made by people who had been consuming hallucinogenic mushrooms for years," he said with a poker face. "And Lenin's personality was replaced with that of a mushroom because fly-agaric identity is far stronger than a human one." Therefore, he concluded, Lenin became a mushroom himself. Prank that went too farAfter that sensational statement, the program went on for another 20 minutes, with Kurekhin and Sholokhov citing endless "evidence" of Lenin's affinity for mushrooms, starting from his passion for collecting fungi and going so far as to compare a photo of an armored vehicle Lenin once posed on to fungal mycelium. Russia-KAt some point, both couldn't help but laugh after stating that the Soviet hammer and a sickle symbol was, in fact, combination of a mushroom and a mushroom picker's knife. But even the laughter didn't prevent thousands of people from taking the program seriously. Bolt from the blue"Had Kurekhin been speaking of anyone else, his words would easily have been dismissed as a joke. But Lenin! How could one joke about Lenin? Especially on Soviet television," Russian anthropologist Alexei Yurchak said to explain the gullibility of many Soviet viewers.. He emphasized that viewers didn't necessarily believe that Lenin was a mushroom - but they treated Kurekhin as a serious researcher, calling the television and writing letters demanding that the station confirm or refute the idea of the Bolshevik leader being a fungus. Sergei Sholokhov, who made the program together with Kurekhin, later said: "The day after the show aired, a delegation of old Bolsheviks went to our local Communist party boss who was in charge of ideology and demanded an answer - was Lenin a mushroom or not. She answered with a fierce 'No!' claiming that 'a mammal cannot be a plant'." Both himself and Kurekhin were quite shocked by such an answer, Sholokhov notes. On the other hand, Sholokhov may have made the story up - just like he and Kurekhin (who died in 1996) did with the TV show. Soviet absurdismIt was Kurekhin, a humorous hoaxer who came up with the idea. In the late 1980s and early 1990s the world of Soviet media was changing, and as journalists enjoyed more freedom, some of them were talking nonsense. As Kurekhin's widow Anastasia recalled, "Once we saw a TV show on the death of Sergey Yesenin (the Russian poet who committed suicide in 1925). The host built his "proof" that Yesenin had actually been killed on absolutely absurd arguments. They showed photos of the poet's funeral and said: "Look, this man is looking this way and that man is looking the other way, so it means that Yesenin was killed." Kurekhin saw it and said to Anastasia: "You know, you can prove anything using such "evidence". And so he did. Alexei Yurchak explains that the hoax and people's reactions to it was a good illustration of how people, no matter where they live, tend to trust the media without checking facts. "If there's something in the media, there must be something to it," Yurchak wrote. Kurekhin's provocation was a hilarious way to prove how easy it is to feed people with the most bizarre nonsense if you sound confident enough. Real-life Lenin wasn't boring at all as well. Maybe Kurekhin exaggerated his admiration towards mushrooms but he surely had passions. For instance, read an article on his love triangle with his wife and mistress (both of them were devoted Bolsheviks, by the way). Russian history Vladimir Lenin tv More exciting stories and videos on Russia Beyond's Facebook page Read more Goths, emos, and other youth subcultures: Where have they gone in Russia?Why are stand-up comedians so shocked by the Russian accent?OPINION: Stop hyping 'post-Soviet' culture, ok?